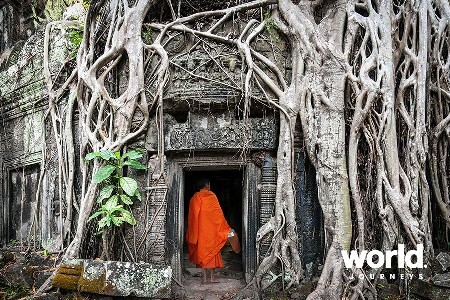 On this small group tour (maximum 10 guests) explore Vietnam and Cambodia, two very vibrant and fascinating countries. Spend 14 days absorbing the culinary delicacies, visiting friendly locals and heritage highlights of these two Southeast Asia gems. 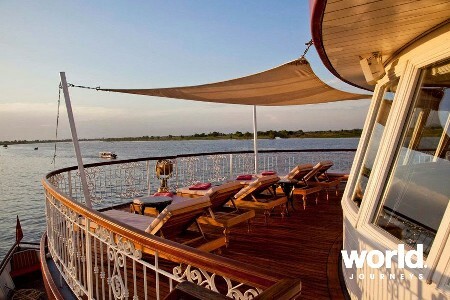 Cruise aboard the lovely Jahan passing by Cambodia's rural villages, enjoy exclusive culture talks and excursions. 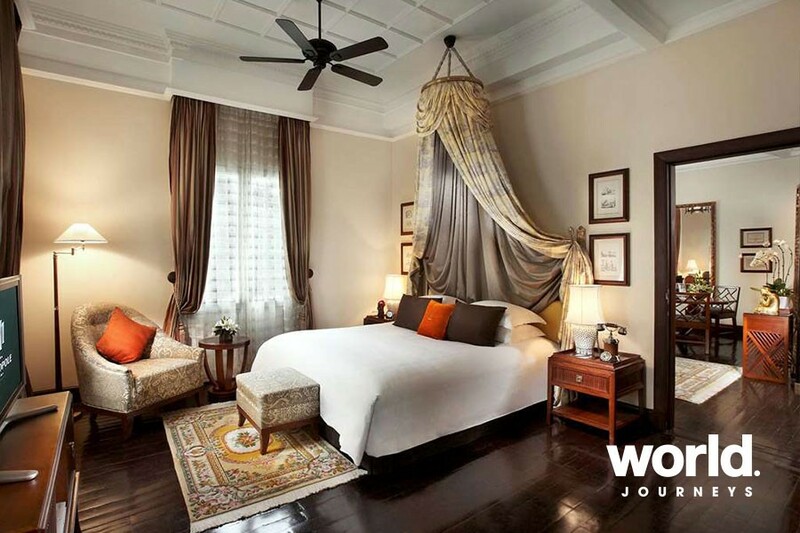 A highlight will be the magnificent Angkor temple complex and a one-of-a-kind dinner at an exclusive residence. 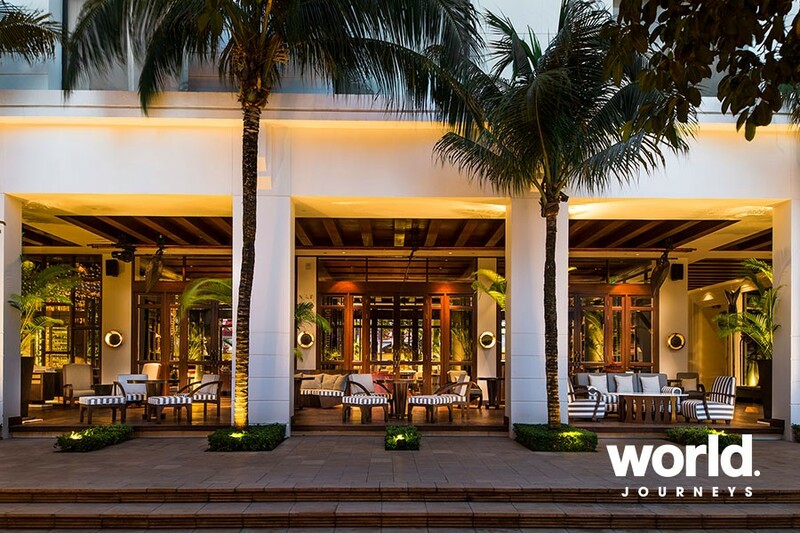 Explore in luxury and style with a combination of 4 and 5 star hotels throughout. Day 1: Hanoi Upon arrival, you will be met and transferred to your hotel. Day 2: Hanoi (B) Explore the charming city of Hanoi, often referred to as the 'Paris of the East', with its yellow ochre colonial buildings, tree-lined boulevards and scenic lakes. Visit outside the historic Ho Chi Minh Mausoleum, an imposing monument of marble and granite built to house the preserved body of beloved Vietminh leader Ho Chi Minh. 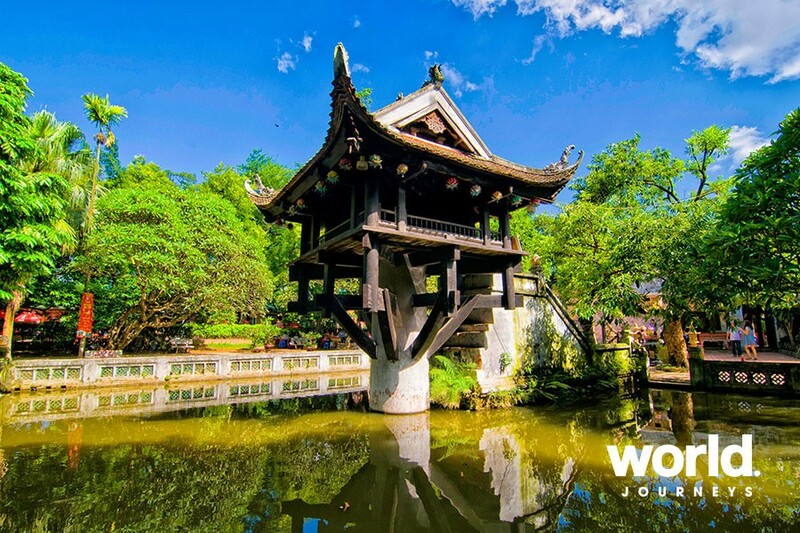 Visit the One Pillar Pagoda, a Buddhist temple built in 1049 of wood in the shape of a lotus blossom and set on a single stone pillar. Continue on to Ho Chi Minh's House nearby, a simple wooden house in a tranquil setting where Ho Chi Minh lived and worked. Some of his belongings are on display and visitors can walk up the steps to see his bedroom. Next, enjoy cultural talk with Dr. Dao Duc, who has deep knowledge on Vietnamese Cultures, history & ethnic research. Participate in a 45-minute presentation on Vietnamese history spanning three thousand years and the varied aspects of Vietnamese culture. This is also a great opportunity to find out how he introduces the nation's culture and his life experiences to the world. Afterwards, visit the Temple of Literature, Vietnam's first national university built in the late 11th century. The picturesque temple is an example of well-preserved traditional Vietnamese architecture and is featured on the back of the 100,000 Vietnamese dong banknote. In the afternoon, visit the Hoa Lo prison, used by the French to imprison Vietnamese patriots. Drive back to central Hanoi for a 1hr cyclo tour through the famed Old Quarter known for its '36 streets of 36 wares' named after the original 36 artisan guilds that date as far back as the 13th century. Explore the fascinating maze of back streets, fronted by narrow houses known as "tunnel" or "tube houses", built to avoid taxes based on the width of their frontage onto the street, a wonderfully eclectic glimpse into Hanoi street life. Day 3: Hanoi > Halong Bay (B,L,D) Depart for a 3.5hr journey to Halong Bay stopping for a break at Dai Viet Center - the best place to stop and stretch your legs en route. 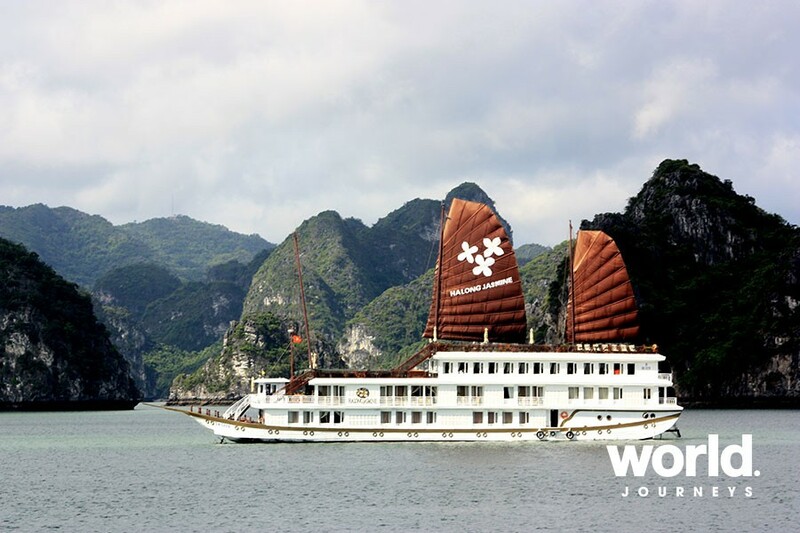 On arrival in Halong Bay, board your deluxe junk, settle into your cabin and enjoy lunch on deck. In mid-afternoon visit the mysterious Tien Ong Cave - a wide cave but short entrance which is said to resemble the shape of frog's mouth. In 2007 a team of Vietnamese archeologist conducted extensive research which led to the discovery of human bones and artifacts dating to 10,000 - 8,000BC, and then continue to Cua Van area. It was once the fishing village, however most of them have moved on land for their children's education. Head back to the boat, participate in a cooking demonstration with the chef or enjoy sunset on the top deck before dinner. Day 4: Halong Bay > Siem Reap Rise early and greet the day with another refreshing Tai Chi demonstration on the upper deck. Then it is time for an early morning swim in the Bay. 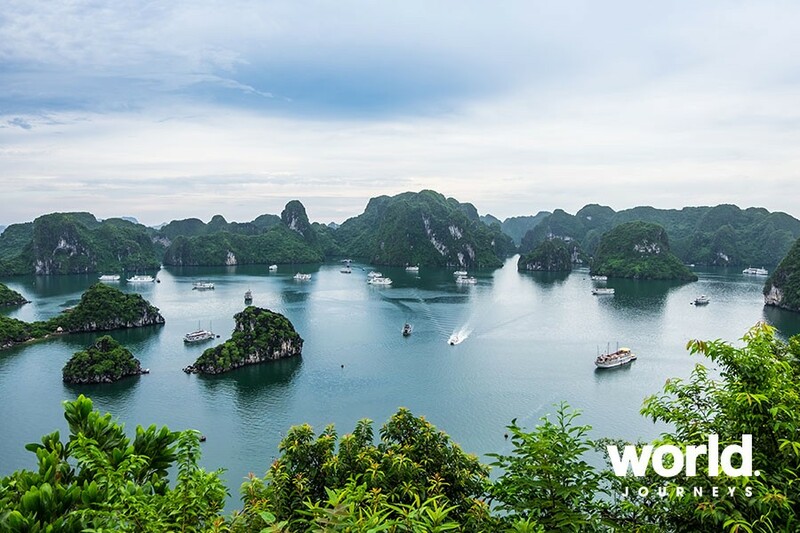 Visit a natural white sandy beach by boat and then return to the boat and cruise slowly back to Halong City. Breakfast is served before we arrive at the jetty in late morning. Disembark at Tuan Chau New Marina. Transfer back to Noi Bai airport for your onward flight to Siem Reap. Upon arrival inside the arrival terminal, you will be met by a guide, who will be waiting outside the arrival terminal. Transfer to your hotel for check-in. Day 5: Siem Reap (B,D) Wake up early and transfer by private vehicle to the West Gate of Angkor Wat from where the sunrise can be best seen. Enter the temple complex. 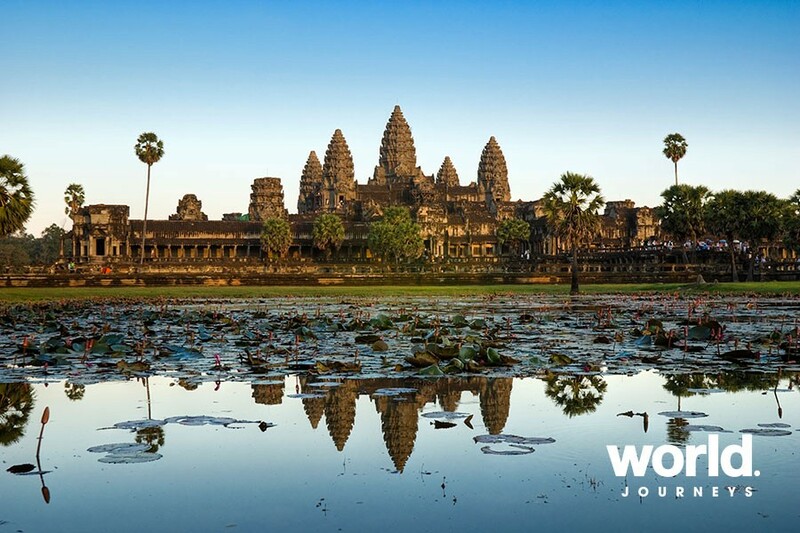 Angkor Wat is surrounded by a large moat and is claimed to be the largest religious building in the world. It is certainly one of the wonders of the ancient world. You will be amazed by the sheer size of the temple, which took 30 years to construct & had 300,000 workers. Angkor Wat was built as the earthly representation of the universe with its' central tower symbolising Mt Meru which, Hindus believe, is at the centre of the Universe. Return to your hotel for breakfast. Drive to visit Banteay Kdei built between the 12th and 13th centuries. The ruined condition of the temple in no way detracts from the grandeur of this walled temple. Banteay means fortified monastery and refers to the double wall surrounding it. Continue to Ta Prohm, this beautiful temple, built in 1186 as a Buddhist temple dedicated to the mother of Jayavarman VII, is one of Angkor's jewels and is overgrown with fig trees, giving a haunting yet exotic atmosphere. The magnificent roots of the trees have merged over the centuries with the temple's huge stone blocks, creating a 'forgotten city' feeling. Pause at Ta Keo, which would have been the finest temples in Angkor had it been completed. A short distance further are the twin temples of Chau Say Tevoda and Thommanon. Drive to Angkor Thom, not a temple, but an entire walled city of 9sq km and served as the ancient royal Capital of the Khmer Empire from approx. 1181. With a probable population of 1 million, it was far bigger and grander than any city in Europe at the time. Your guide will take you to the Terrace of the Elephants and the Terrace of the Leper King. 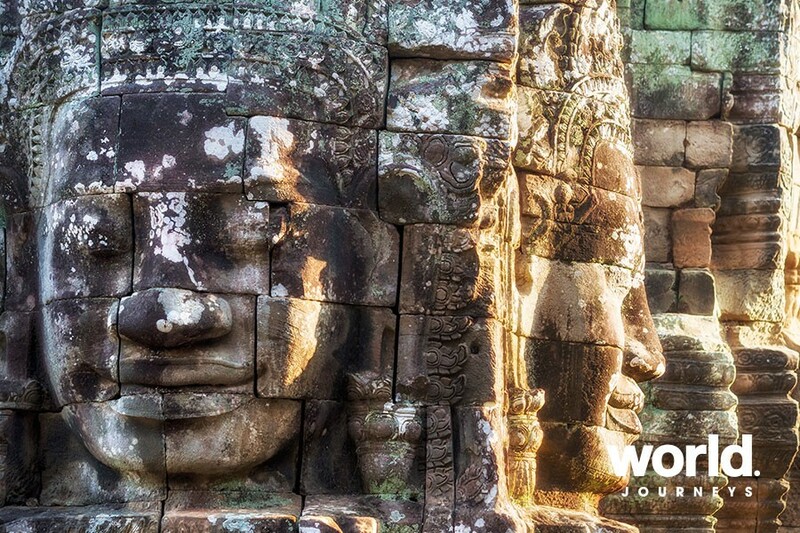 The centre piece of Jayavarman VII's Capital is the Bayon temple and, as you approach, you will notice the 216 giant, enigmatic, smiling faces looking into every direction. Return to the South gate where you will board a small, private boat out to Prasat Chrung Temple to watch the amazing sunset. Tonight, we take you to one of the few places in town where you will savour delicious Khmer cuisine and have the privilege to watch a live Apsara Dance Performance by the top Apsara dancers of Siem Reap. Situated in the serene gardens of the most iconic hotel in Cambodia, enter the Apsara Terrace by way of traditional Cambodian boundary stones with imposing wooden gates and enjoy a majestic performance with Cambodian dances and Khmer martial arts. The performance is viewed with a selection from the pan-Asian barbeque cuisine At Raffles Grand Angkor. Day 6: Siem Reap (B,L) All across Asia, food is at the very heart of every single person's day. As the average Cambodian makes $3 per day, the means and ways of eating fresh healthy & seasonal food are at the forefront of every meal time. Today you will be part of a culinary experience, creating some of Cambodia's most fashionable & iconic dishes, while engaging with the day to day lives of its people. Starting out from the private farm, with your Chef, you will view the range of different vegetables, available in the season growing fresh & organically. Your Chef will explain to you the key ways in which they filtrate water, tend to their crops and create the perfect harvest! A small journey onwards, will take you to a very local and completely tourist free village, where you will be the highlight of the villagers day! Walking with the chef to explore local traditions, weave past market traders & view the range of produce, selecting key ingredients to use in your class. Furthermore, the experience will engage with the locals in need, through a generous donation. Together with your chef, you will select a basket of harvest & dried goods for you to present to the Head Villager, as a kind offering in their day to day lives; giving back in the purest & simplest way! Taking tea, or sugar cane juice in the Village in a simple cafe, you will get a real feel of the true lives of the Khmer. Returning back to the farm, your Chef will then lead you through the remarkable ingredients used to make your 3 course lunch. Preparing at your own station, while he talks you through the methods used to create each dish. Have fun with learning about the new vegetables, creating the sauces & tasting as you go, the experience can be as advanced, or as Chef led as you wish! Afterwards you will eat your lunch, at the Farm House and enjoy the fruits of your labor in a truly philanthropic, engaging experience in Cambodia. In the afternoon, discover Siem Reap's artistic side with a visit to several of the best workshops and galleries. Artisans d'Angkor, our first stop, has developed from the ambitious belief that it is possible to revive ancient Khmer Arts & Crafts while improving the lives of thousands of people living in rural areas. Not only has Artisans d'Angkor become a company dedicated to the preservation of traditional Khmer skills in silk-making, stone and wood carving, lacquering, silverware and painting, but it is also an organization committed to promote the development of individuals and secure their future by the means of education and welfare. Today, their 1,300 employees are proud to show that Cambodian handicraft is still alive and more creative than ever. Continue to Theam's House. At 11 years old, Theam was among the flood of Cambodian refugees who arrived in France in 1980. After receiving a sound artistic and technical education in interior design in Paris, Theam set aside his dreams and journeyed to the place he had fled from 15 years ago. He is one of the few overseas-educated Cambodians who are helping revive the Khmer craft sector. He now has launched a new art project that includes training a team of protege artisans' apprentices while he embarks on a new creative journey of his own painting. He converted his personal house to a real working space dedicated to the creation and promotion of Cambodian arts & crafts including lacquers, painting, and sculpture, with pieces that are uniquely expressive while also maintaining a strong Khmer ethic. Later check out one of the best photo galleries in town. American photographer John McDermott first came to Angkor in 1995 to witness a total eclipse of the sun. Inspired by the surreal, otherworldly light of the eclipse, he returned again and again over the next several years to create a definitive artistic portrait of the ancient Khmer temples. He now lives with his wife and young son in Siem Reap, where he founded three galleries that exhibit the work of Cambodian artists and photographers working across Asia. John McDermott's work is on display as part of the permanent collection at the National Museum in Phnom Penh, Cambodia. His photographs are held in private collections worldwide and have been printed in numerous books and publications, including Time, Newsweek, The International Herald Tribune, and The New York Times. He continues to photograph projects around the world. Later, return to your hotel. 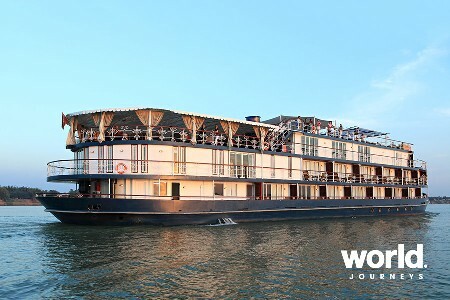 Day 7: Embark on The Jahan Cruise / Siem Reap - Tonle River (B,L,D) Meet your guide in the lobby hotel to transfer to Jahan's meeting point before moving to Jahan cruise. We gather in the morning at our welcome lounge in Siem Reap. Lean back with a drink as our staff welcomes you and collects your details for the boarding. We bid farewell to the iconic sight of Ankor and travel a short distance to the pier at the Tonle Lake. By local boat we transfer to our beautiful ship and the crew warmly welcomes you on board. 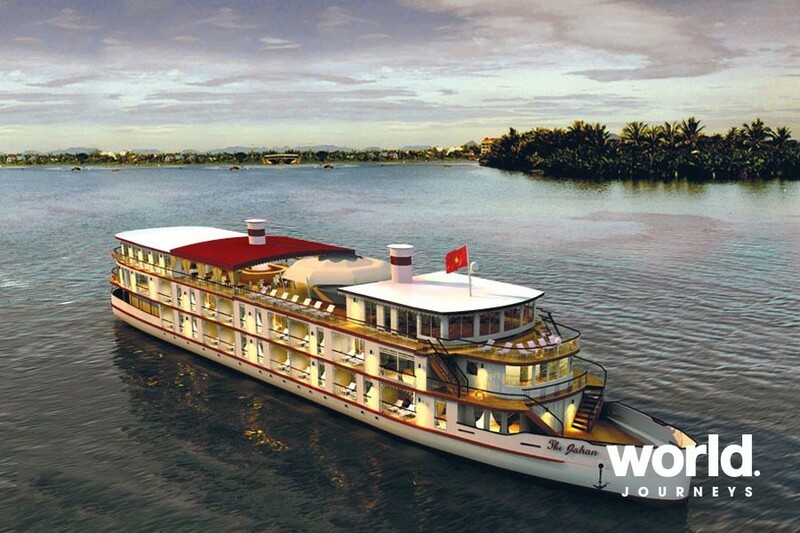 While you check in to your prepared staterooms the ship sets sail and your fasctinating journey on the Mighty Mekong can begin. You have lunch on board during the vessel gently glides over the Tonle Lake. The lake can only be crossed during high water season (approx. from End-July to Mid-November). Let your soul float and your eyes wander while the boat makes its way across. After lunch our expert guides offers a presentation about the "Geography of the Mekong and Tonle Sap". In the afternoon we serve a high tea at the open bar. Enjoy your cruising day onboard, relax on your balcony or relish a spa treatment before dinner. The boat moors in the Tonle River. You can join our evening cinema session (offered every night) featuring selected classic movies. Day 8: Kampong Chhnang - Kampong Tralach - Kampong Cham (B,L,D Wake up early to witness this spectacular water-world in the break of down. Our moring Tai Chi class has the perfect backdrop today. Breakfast buffet is served in the restaurant. We are now at Kampong Chhnang, Cambodia's "water world", where everything is on sticks balanced on water rich soil. This is the most fascinating cruise part in Cambodia. We take a local boat to the shore. With mini buses we head to a rural village nearby and go on a walking tour. Our guides introduce the village specialities "“ Khmer style pottery and the making of palm sugar. Definitely you should bring home some. 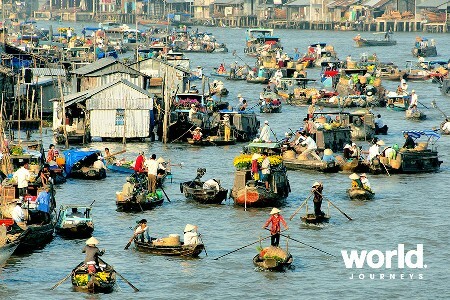 Before returning to the boat we explore the local floating villages and wetlands of the region. Back on board lunch is served while the cruise continues with a languid meander along the Tonle River towards Kampong Tralach. 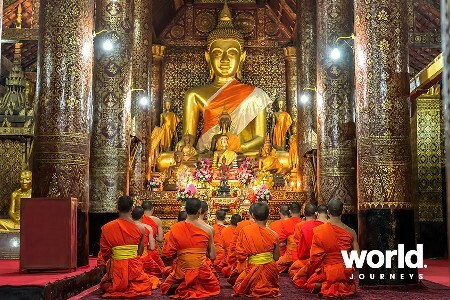 A Monks' blessing ceremony on board will deliver spirits and wishes for our health and prosperity for all. Gliding through leafy swaths of this jungle-like landscape we reach Kampong Tralach. Cacophonous children waive enthusiastically while bringing their livestock for a bath in the meandering river. Live to see all this life - which is so much different than ours - by a local ox cart ride. Day 9: Kampong Cham - Okhna Tey - Phnom Penh (B,L,D) After a sumptuous breakfast, we travel by bus to a local school to understand more about the education of the young Cambodian generation. Those children here are always excited to show their skills in music and art. We continue by road to arrive at the enchanting pre-Angkorian temple of Wat Hanchey (7th century). 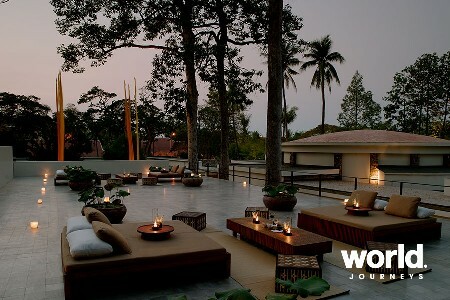 This small complex sits on a hill top right on the shore with breath-taking views on the Mekong. After some refreshment back on the ship we serve lunch. During the afternoon our staff is keen to show you the variety of traditional Khmer fashion. Watch the riverbank life along the Mekong during our high tea as the ship proceeds to its next stop. We arrive at the Island of Koh Oknha Tey. This spot in the middle of the Mekong owns its fame for the manufacturing of high class silk products. By tuk tuk we explore the island with its workshops and learn how silk is processed from its source, provided by little silkworms, to a final top quality product made of original Cambodian silk. Day 10: Phnom Penh (B,L,D) Welome to Phnom Penh - the once called Paris of the East. 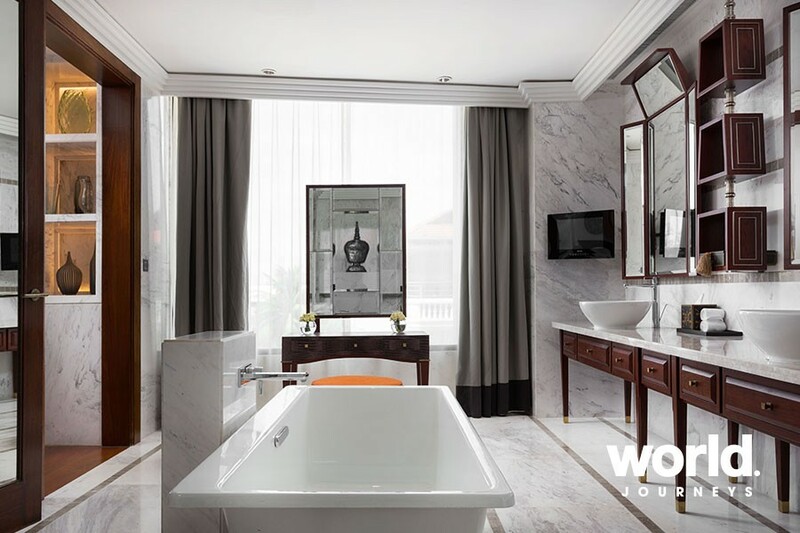 Despite its rapid development, it has retained a lot of its rustic charm and elegance. It is an amazing town to bespeak centuries of incredible history and culture which can still be felt at many street corners. We start with a full sight-seeing tour right after breakfast. By bus we visit the Killing Fields at the outskirts of the city and after the centrally located prison "S21". Both historic sites display the sad and cruel chapter of Khmer history when once the Khmer Rouge ruled the country with terror and suppression. Those places have merely changed much since the horrific time back in the early seventies and so it can be heart wrenching. There is the alternative to explore the city during the morning by your own pace individually before re-joining the group. Lunch will be in a nice restaurant in town. 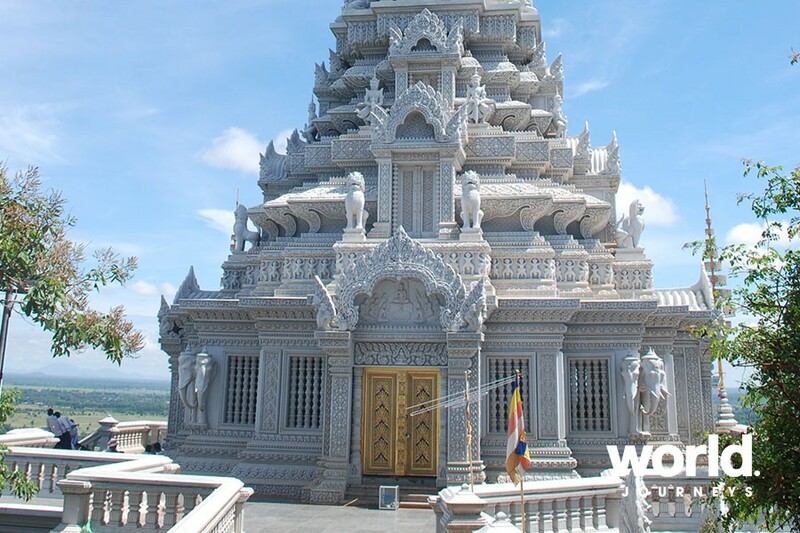 Our exploration of Phnom Penh focuses afterwards on the fascinating cultural heritage of Phnom Penh. The golden edifice of the Royal Palace with its Silver Pagoda and the exceptional Khmer crafts at the National Museum are the afternoon highlights. The day trip ends with a "cyclo" ride back to the ship through the bustling streets of downtown Phnom Penh. Take some rest in your spacious cabin or join other fellow passengers at the bar for some refreshing drinks before our capturing evening activities start. It begins with a variety of cocktails served on the sun deck or at the open bar. We move to the lounge which is set up for a captivating lecture about Cambodian mordern history, held by a professor of the Royal University of Phnom Penh. Definitely among the highlights of this cruise to receive knowledge out of first hand as our lecturer had a private relation to the former King of Cambodia and many other high ranking politician. After the lecture a feast of barbecue dinner on the sun deck commences. The dinner is accompanied by an Apsara dance performance. You have to witness the brilliance and richness of this dance along with the soothing sounds of traditional music. As the evening unwinds enjoy your supper with a good glass of wine and marvel at the skyline of Phnom Penh and the calming flow of the Tonle River. Day 11: Phnom Penh (B) After you have enjoyed your last breakfast on Jahan, you will be transferred to the Pier where you will meet with our guide and we transfer you for touring around Phnom Penh. After the Khmer Rouge regime, the city was sadly left a shadow of its former self. Now, due to a strong, young dynamism, the city is once again a vibrant, growing capital. Spend a half day learning more about the turbulent Khmer Rouge years with visits to Tuol Sleng, a high school turned interrogation prison known as S-21 during the Khmer Rouge era and now a genocide museum; and Cheung Ek, a large memorial commemorating the 17,000 victims who died there under the reign of Khmer Rouge leader, Pol Pot, made famous by the movie "The Killing Fields". While sombre reminders of the cruelty of the Khmer Rouge regime, these visits will also provide an appreciation of the struggle that Cambodian people have faced and their tremendous courage to move on and rebuild their nation. Return to your hotel. Day 12: Phnom Penh > Saigon (B) Morning at leisure till your car and guide come to your hotel and transfer you to the airport. Upon arrival Tan Son Nhat airport, your guide will come to meet you and transfer you to hotel. 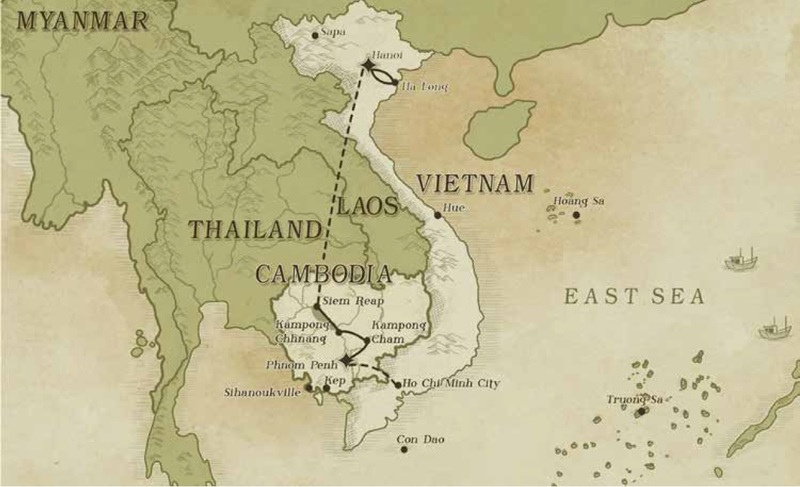 Day 13: Saigon (B,D) From Saigon, take a 2hr drive northwest to the famous Cu Chi Tunnels, an immense network of connecting underground tunnels started in 1948 to protect the Viet Cong guerrillas from the French air and ground sweeps. The tunnels also served as living quarters, communication and supply routes, and housed hospitals, food and weapons caches. Touring the underground compounds will provide a better understanding of the history of the tunnels, the hardship of life in the tunnels and the Vietnamese resilience during combat. Return to Saigon. 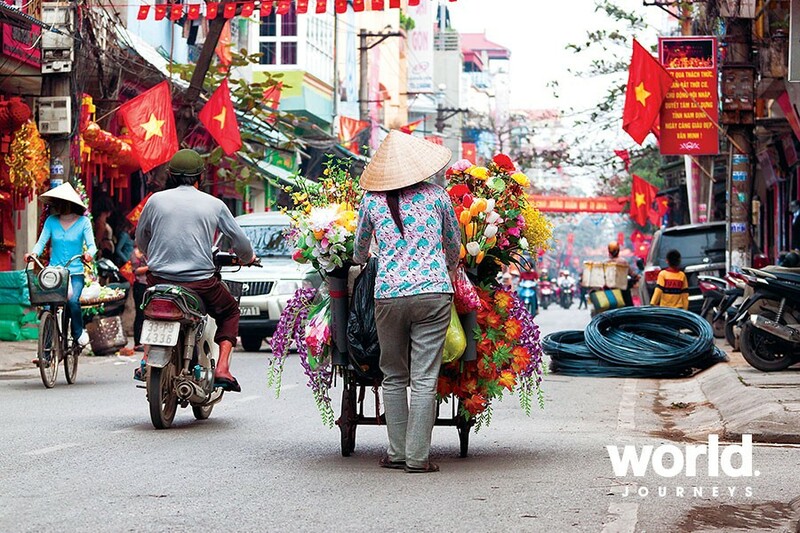 With over eight million inhabitants and four million motorbikes, Saigon is truly a city that never sleeps. Despite its modernity, Saigon maintains a strong link to the past and our city tour takes in some of Saigon's most historic landmarks including the Notre Dame Cathedral, a red brick edifice with twin spires constructed from materials imported from France (entrance is only permitted when no services are being performed). Then head across the square to the Central Post Office, completed in 1891. A short drive away is the former Presidential Palace, the headquarters of the Saigon Government during the American War. Continue to the War Remnants Museum for a vivid perspective of the American War through the eyes of the Vietnamese. (Please note that some of the displays are very graphic.) Experience Saigon's famed street coffee culture while your guide provides a brief language lesson as well as insights into daily life of a Saigonese before returning to your hotel. Follow our trail through an alley dotted with colonial era mansions until you reach a gate, behind of which an enchanting home awaits. 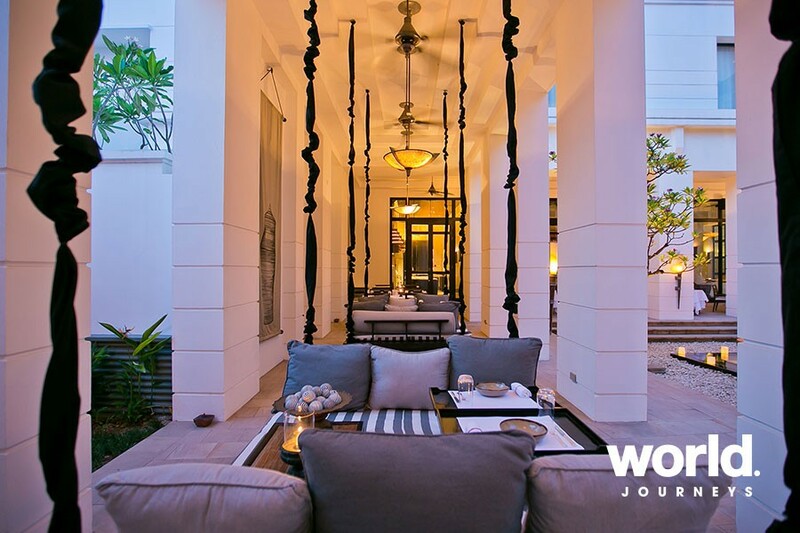 The US Ambassador to South Vietnam in the 1960s, Henry Cabot Lodge, lived in this stylish residence from '60 - '65 and today it has been restored to its former glory. 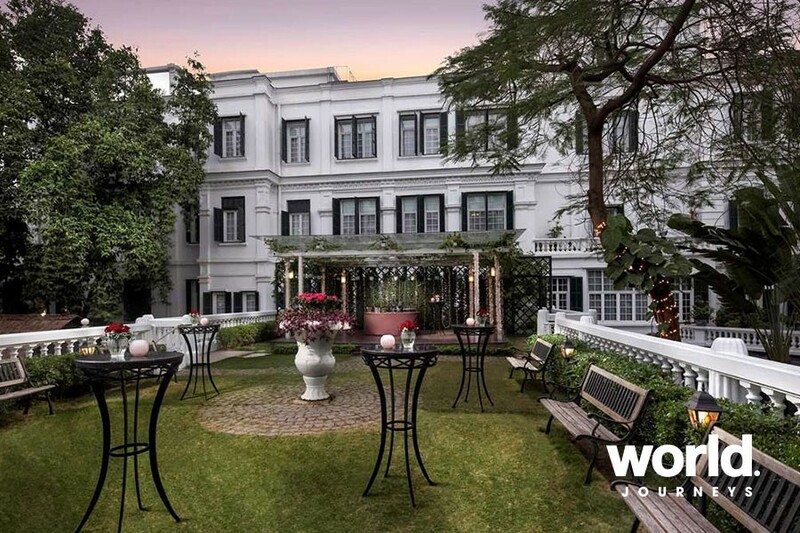 Perfectly suited to social gatherings for up to 40 persons, guests will enjoy a cocktail reception complete with traditional dance performances in the intimate courtyard. A sophisticated Vietnamese meal will be served in the magnificent dining room and is accompanied by live music to create a memorable atmosphere. Day 14: Saigon (B) Meet your guide in hotel lobby and we transfer you to Saigon airport for your homebound flight. Maximum group size is 10 travellers, accompanied by a leader from Day 1. Minimum group size is 5 guests.